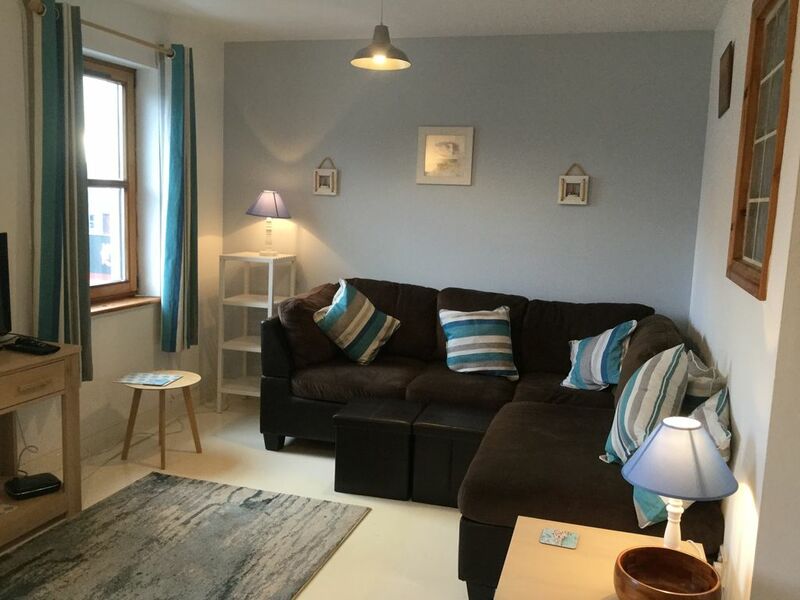 New : This cosy seaside apartment situated in the center of the buzzing town of Moville in County Donegal, is a two minute walk to the sea, shops, bars and numerous restaurants. The entrance to the beach is between the shops opposite the apartment. Park your car and forget it. The lounge is designed for comfort. The TV has UK free view channels. There is super fast WiFi and Netflix. There are two bedrooms, a king size bed in one and bunk beds in the other. A generous sized shower room. The newly fitted seaside kitchen boasts a dishwasher, washing machine and fridge freezer. There is plenty of on street parking with no restrictions. We have only just finished furnishing the property and has only just gone live which is why there are no reviews yet. To see the standard of our properties look at the Fort on Homeaway 854298 and the Stables property no 6923570. All our properties have been awarded the title of premium partners by Homeaway. Derry airport is a 35 minute drive away and Derry about 25 minutes drive. Moville is ideally located for exploring the various beaches on the inishowen peninsula. We live and work in London and fell in love with this beautiful part of Donegal and decided to purchase the property and put it with Homeaway and share the experience. We currently have 3 properties within 5 mins drive of each other. We stay at whichever property is vacant. The picture shows me (black coat) with my husband and darling Sister at Malin head. It came in the market. Several people were interested and our bid was accepted. It is in such a terrific location. The apartment is located in the middle of the town. The entrance to the beach is between the shops opposite. Everything is nearby. Beach opposite, surrounded by bars and restaurants and a wide choice of shops. The apartment has a lovely cosy feel. If you don’t want to drive everything is on your doorstep. This is a lovely apartment situated in the center of town making it convenient for all the local bars, cafes and supermarkets. The apartment is only a few minutes walk to the sea where we enjoyed a stroll along the shore front path. There is ample free roadside parking outside the property. The secluded beach at Kinnagoe Bay is a short drive away and well worth a visit. Also worth visiting is the Famine Village on The Isle of Doagh and the Glenevin Waterfall in Clonmany. There is so much to see in the area. Surrounded by bars and restaurants and Inish adventures is a walk away. The entrance to the beach is opposite the apartment. A short drive to the Famin Village or Malin head. A security deposit of £120/E120 ( cash) is payable on arrival and will be returned when you hand back the keys.